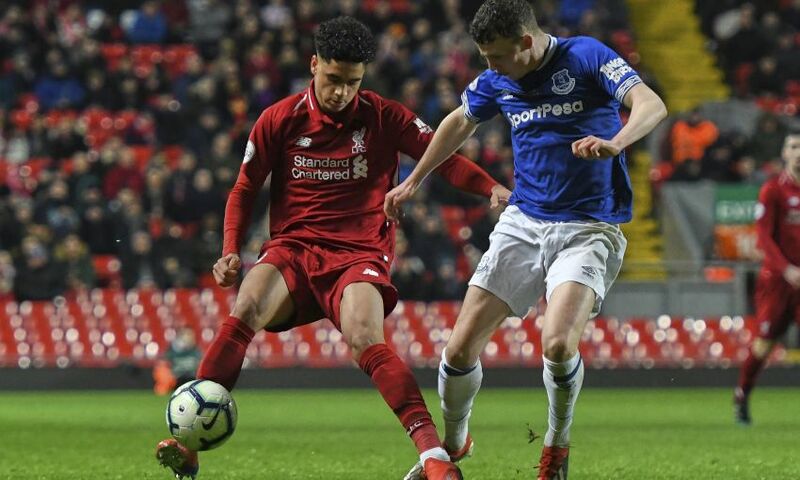 Liverpool U23s were beaten for the first time since November as Everton edged Monday night's mini-derby at Anfield 2-0. Nathan Broadhead’s double separated the sides in their Premier League 2 encounter, with Neil Critchley’s charges unable to turn their exertions into goals against the leaders. That meant a first defeat in three-and-a-half months for the young Reds, who remain fifth in the division as a result. Jürgen Klopp, Pepijn Lijnders and John Achterberg were among the healthy crowd at a rain-soaked Anfield to see the second Merseyside derby in as many days. Everton came into the clash with a four-point lead at the top of Premier League 2 and wasted little time in showing their intent to consolidate that position against a Reds side on a 13-game unbeaten run in all competitions. Only three minutes had elapsed when Lewis Gibson met a deep free-kick into the area from the left with a looping header that bounced out off the Liverpool crossbar. But the Blues did take the lead in the eighth minute. Josh Bowler’s surge into the box along the right was followed by a fierce clip across the goalmouth, with Broadhead the grateful recipient at the far post to convert past Caoimhin Kelleher. Buoyed by their breakthrough, the visitors pushed for a quickfire second and Bassala Sambou might have done better than drag a low hit wide after confident work by Fraser Hornby in the build-up. Liverpool settled and Ben Woodburn fashioned a first genuine sight of goal when he instinctively spun on Ki-Jana Hoever’s delivery to the near post and sent a strike off the ground and into Joao Virginia’s gloves. 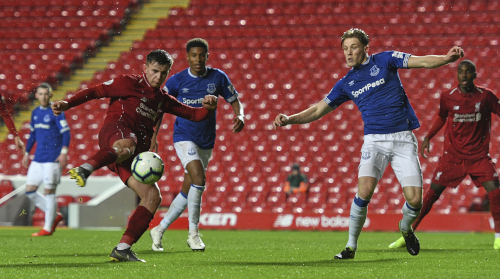 Hornby nodded a fine chance from Ryan Astley’s cross into the Kop, while Hoever was off target with a drive from 20 yards after Curtis Jones was crowded out by the Everton defensive ranks. It was cat-and-mouse for the remainder of the first half, neither side finding the quality required in the last third, though the young Reds narrowly avoided a second concession in its final act. The bounce of a long ball, coupled with Sambou’s interest, caused confusion, but Corey Whelan half-cleared with Kelleher out of goal, and Broadhead’s chipped rebound from distance drifted wide to the left. Jones’ strength in possession led to the maiden opportunity of the second half, Rafael Camacho collecting his pass and centring for Isaac Christie-Davies, who headed too high. It was again the Blues creating the truly dangerous openings, however, with Dennis Adeniran’s counter-attack surge from his own half deserving a more precise final finish when he fed the free Sambou to his right. Kelleher made two excellent saves to keep Liverpool in the match after the hour mark. The goalkeeper first pushed over a firm effort from Nathangelo Markelo, teed up by Sambou at the edge of the area, and then – from the resulting corner – showed sharp reflexes to deny Astley’s hooked shot. Critchley reshuffled his pack with the introductions of Tony Gallacher, which freed Adam Lewis to play further forward, and Glen McAuley as Liverpool took greater control and Everton played on the break. The tactic almost worked for the away team, with Broadhead only a George Johnston block away from a close-range strike that might have sealed victory. He did have the last word on 87 minutes, though. Hornby turned a knock forward into another promising breakaway and substitute Anthony Gordon sprinted away on the right before squaring for Broadhead to clinically sweep low past Kelleher’s reach and inflict a rare loss on the young Reds. Liverpool U23s: Kelleher, Hoever (McAuley, 74), Lewis, Whelan, Johnston, Coyle (Gallacher, 66), Camacho, Randall, Woodburn, Christie-Davies, Jones. Unused substitutes: Juanma, George, Masterson.